Whenever I post images of Petra, traffic here just zooms up. When I saw this one, boy did Virginia Linch score a homerun/touchdown/swisssh bucket! Petra loves the Briar Patch. No doubt she remembered her 2015 visit. She got the royal treatment from Virginia, Stanley, and the tireless volunteers from Ritz Carlton (there to help assemble a huge canopy ahead of the Earth Day 2016 festivities). Me? I love the Butterflies & Blooms in the Briar Patch. Eatonton, Georgia, the county seat of Putnam County, where Br’er Rabbit and Br’er Fox became ink to paper. My mother read me those stories when I was a child in Brooklyn, New York. Lookee here! I am in the same town, and just 200 feet from the Br’er Rabbit museum, whose docent, Georgia Smith gave me the tour of a lifetime last year. When Virginia shared this look, there I am, the photographer as subject, with his fantastic pup, in this wondrous place, with its special people, just a place that gives, and doesn’t ask for a thing, but your enthusiasm. Southern butterflies, as gracious and beautiful as you’d expect. How Was Your Georgia Trip? We’re back from our 9 days in Spring 2016, in Georgia! Petra came along on this one. She loves long drives, and finds each and every rest station stop equally, exciting! That’s 685 or so miles to Eatonton and 685 miles home again to Pittsburgh. She travels well. We found the Butterflies & Blooms Briar Patch electrifying, with thousands of butterfly attracting plants pushing up from the soil everywhere. Milkweeds, Paw Paw, Hercules Club, Wafer Ash, Passion Flowers, Fennels, Parsleys, Plantains . . . . all very serious, striving to get ready for the butterflies that they will beckon forward, sometimes from many miles away. Petra watched appreciatively as volunteers from Ritz Carlton pitched in to to erect a handsome canopy for the April 23rd Earth Day events. From what I hear, it was a Big success. I slipped away a few days before, to met Phil and his family at Panola Mountain State Park. Panola Mountain is just east of Atlanta. We set out to find Juniper Hairstreaks on rocky granite outcrops, and we did! A lifer for me, these tiny winged beauties are Oh! so pleasing to the eye. Add to that, a rare Lichen grasshopper, and a spider so rare that it lacks a name! Images will (we hope) follow. Israel, Georgia, and planned trips to Maryland and New York. Virginia’s western mountains? Possibly. The Keys? 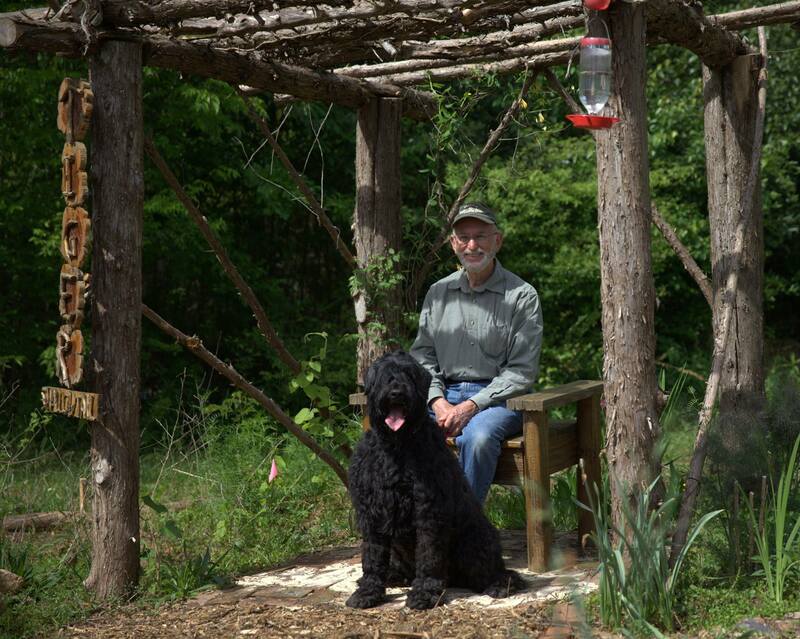 A man (and his Black Russian pup) can/do dream . 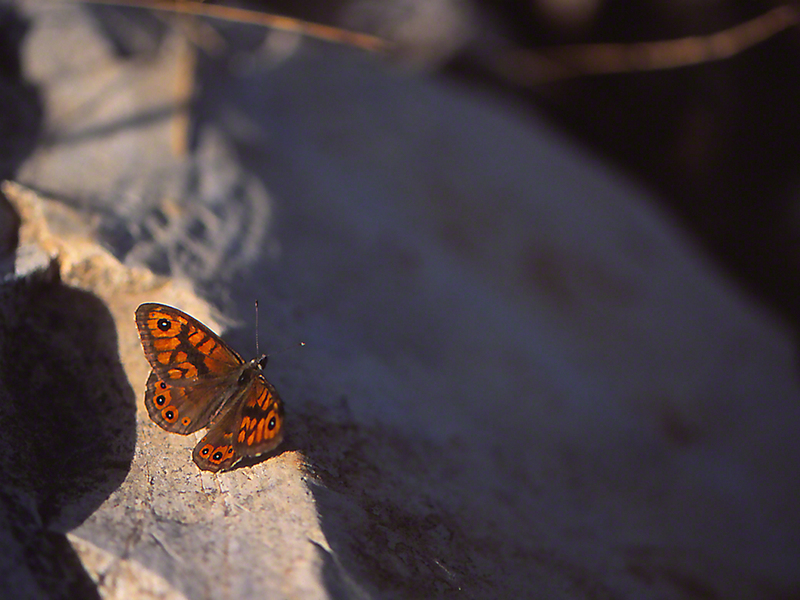 . .
Photographing butterflies necessitates lots of time in the field. Searching, scouring, and even cajoling those reluctant winged beauties to leave their hiding places, and allow themselves to be photographed. Scores of hours are spent working the same trails. Trails that you know and enable you to anticipate where you will score good butterfly images. They’re kind of friends of the Spring hiker, and their appearance each year, along wet trail margins, is comforting, reassuring. They force you to remember your old high school Biology: Plants use their chlorophyll to produce food. Find a plant like these, Indian pipes, and know that they must have some alternative method of manufacturing carbohydrates (food). How do they do that? They grow where they have found rotting plant material, and they intake those newly freed materials, converting them to usable food. ‘Nough said? 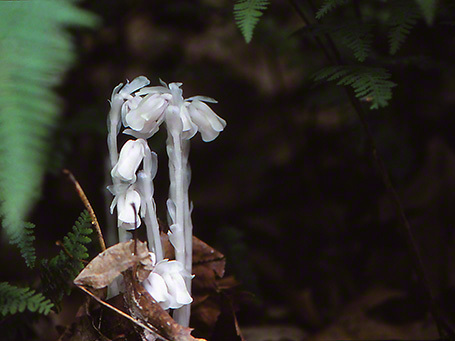 I smile when I see Indian pipe. They look so delicate, fragile. There they are, out there in the wild, not so delicate or fragile. Independent, earnest and successful. They also get an ‘A’ for causing the casual hiker to delve through sooo much stored in the head Biology. Have you ever visited a Butterfly Oasis? No, no not an enclosed space. Try instead a real, dynamic, thriving habitat, with wild butterflies flying in all the time? 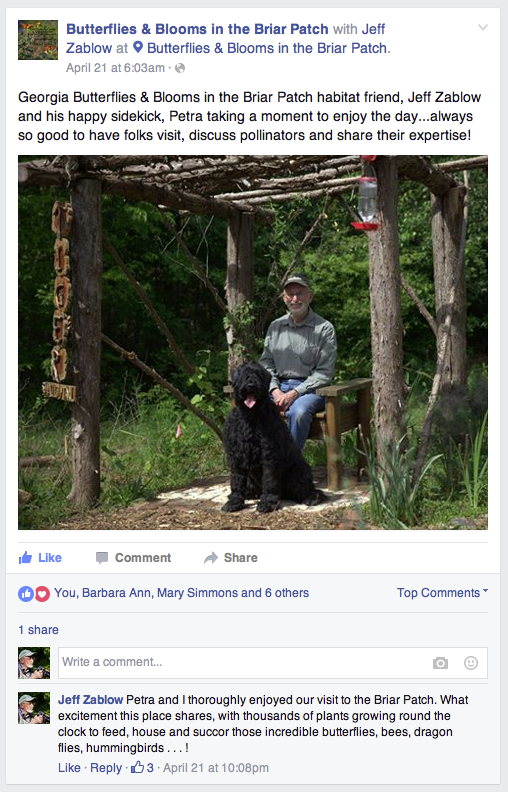 In 2015, I read Facebook posts, sharing snippets of news, about the creation of a butterfly habitat in Eatonton, Georgia. Seeing Southern butterflies was high on my list. I contacted the Founder (she is, no matter how she disclaims that) of this Butterflies and Blooms in the Briar Patch. I received a hearty, Come on Down, and see for yourself! In April 2015 I drove down to Eatonton, about 1.3 hours east of Atlanta. Putnam county was beautiful, lush green. Lake Oconee had already attracted national developers, and many hundreds of fine homes have been added not to far away from the briar patch habitat. The whole area is eye-pleasing. Folks there are friendly and pleasant. I visited 3 more times in 2015, and every visit was the same, positive, upbeat. Virginia C. Linch is that Founder, unflappable, hard-working and a magnet for the project, attracting people in the community to weed, plow, bulldoze, construct, plant and donate botany. Nudge the site, add a water source, as Virginia’s cadre did, to get moisture to the habitat during bone-dry stretches in July and other months. Truck in top-soil, mulch and more. Urge all to bring what they see and learn to their own home gardens, i.e., plant hostplants for caterpillars and flowering plants for adult butterflies. Let’s finish this bullet-list with Virginia’s perhaps most important attribute: She does not give up! She confronts challenges, and finds ways to overcome them, by one way or another. 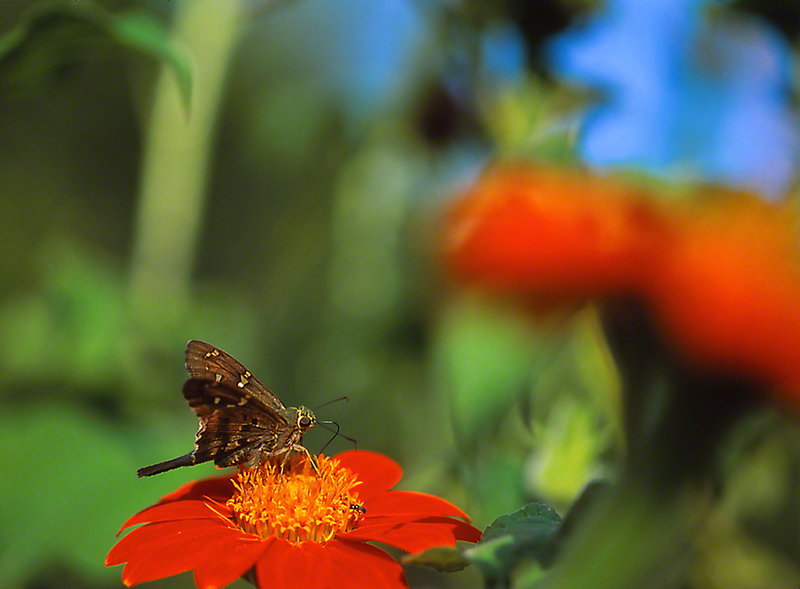 This Long-tailed Skipper butterfly is blissfully sipping nectar from a very fresh Tithonia (Mexican sunflower) bloom. I could not have seen it in my own Pittsburgh, Pennsylvania. It is a southern U.S. butterfly. There was that one morning in August where I saw 29 different species of butterflies in the habitat. Ok, ready? Wow! Butterflies that came from miles away, just to enjoy the sweet nectars offered there. Many, many deposit their eggs while there, and the magnificent cycle continues. I am not sure how many other U.S. cities and towns have such a habitat. My guess? Not enough. I have shared my observations with you, for, truth be told, I remain very . . . impressed. This is for sure an American model that should be emulated. Good for the time being as I am confident that future visits will score closer, more intimate images of this exercise in browns, with eyespots at no additional charge. I have not seen this species since, and if I have, it’s been one of the many blurrrrrs that rocket away as I work the trails. That’s one of the many challenges and thrills of future hikes. What will we see and what will we capture (on film) and . . . how will readers measure our shares of elusive wild butterflies, who never, or who fleetingly suppress their escape behaviors?